Child Care Aware, Region 6E, works in partnerships with families, early childhood professionals, and community organizations, as well as district, state, and national Child Care Aware offices to help improve access to high quality child care and early education opportunities for all children. We are your trusted source for child care resources and referral. Call 1-888-291-9811 or search our online tool. Learn more about healthy child development. Check out grants and scholarships for early childhood professionals and programs. Let your Stars shine with the Parent Aware Quality Improvement Rating System! Share what you know! Learn about the Minnesota Center for Professional Development (MNCPD) trainer approval process. 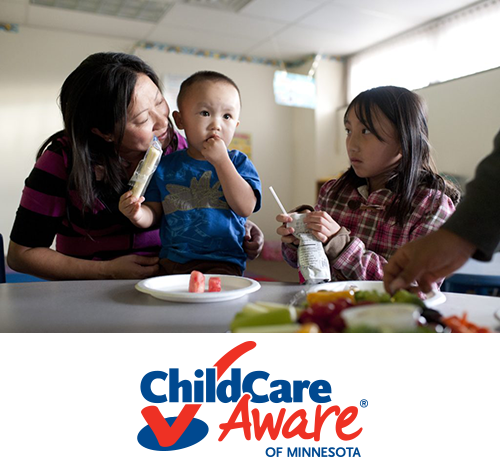 This initiative is made possible (or funded in part) with a grant from the Minnesota Department of Human Services using Federal funding, CFDA 84.412A – Federal Race to the Top Early Learning Challenge Grant.